Award-winning string quartet and trio based in the Midlands. "Your playing was exquisite - I can still hear it in my head as I type and will remember it forever." Back in September 2009, the Mercian String Quartet performed for the first time. The wedding was that of Sam's sister. Nine years later, Sam is still our viola player and we have spent the time in between making musical memories with people all across the Midlands and further afield. 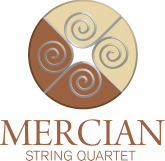 The Mercian String Quartet is an award-winning string quartet. Crafting unique set lists for every wedding and event, we play at the finest venues of the Midlands, Warwickshire, Worcestershire and Staffordshire, making musical memories to last a lifetime.